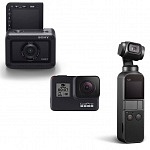 GoPro HERO 5 black was officially announced September 19th along with HERO 5 Session and HERO Session, accompanied by GoPro’s new Drone / Stabilizer Ecosystem Karma. This time HERO black (the only remaining) edition has an integrated 2″ touch screen to frame your shot, change settings, play back and trim your footage. In comparison HERO4 black didn’t have a LCD screen included, a LCD backpack is sold separately. Hero4 silver came with an integrated LCD screen, but the camera was not capable of 4K video resolution in 30fps. GoPro Hero 5 offers electronic image stabilization, which is possible for resolution 1080p up to 60fps. It is not available in 4K as some extract sensor space is required to stabilize the image. 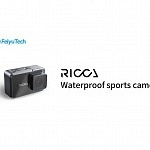 That’s similar to most other action cameras, only Sony’s FDR-X3000 offers video stabilization in 4K, but it is optically stabilized not electronically. 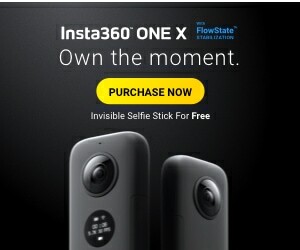 It’s a great feature for selfies. You don’t have to set a timer, fiddle around with the remote or connect to your phone. Just shout “GoPro take a photo” it Hero5 does with a little delay, so you don’t get a photo of you shouting. Be aware not to use it in a crowd of people, they are not used to this feature and will look at you :). Finally GoPro HERO 5 captures GPS data, a feature which was introduced with action cameras long time ago, and I was waiting for it. GPS data is stored within the file and with Quick App for Desktop you can select which information should be displayed in the video as a graphic overlay. Available infos are: Distance, Altitude, Elevation Gain, Date & Time, Speed Tracker, GPS Path, G-Force, Speedometer & GoPro Logo. I also wrote a tutorial on “How to display the data“, as there was some confusion after the launch. Of course the GPS info is also stored in photos, so you can select them per coordinates, like on the iPhone. 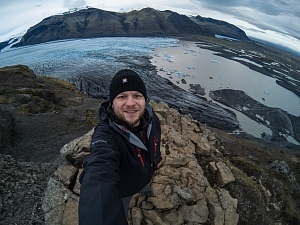 With a GoPro Plus subscription GoPro HERO 5 Black can automatically upload photos and videos directly to the cloud for easy viewing, editing and sharing on the go. Most users expected 4K in 60fps or a even higher resolution like 8K, but GoPro HERO 5 sticks with the same resolution as HERO 4 black. These rumors were coming up all the time, but I’m don’t think consumers would take advantage of these resolutions and can even process them. Currently I don’t know which sensor or processor is used. Due to the fact photo resolution is 12 MP a respective sensor seems to be used, but I guess a more advanced one compared to HERO 4 black’s 12 MP sensor. A new “linear” FOV mode removes the fisheye effect automatically. Photo resolution is 12 MP, GoPro HERO 5 also does RAW & WDR photos! GoPro HERO 5 black can do up to 30 frames in one sec. supports mic in via optional adapter (sold separately). and a microSD slot for cards with at least class 10 or UHS-I rating. Battery of GoPro HERO 5 black was upgraded from 1160 mAh in HERO 4, to a removable 1220mAh lithium-ion battery. Same as GoPro Hero6 black. HERO 5 is recording in stereo and is equipped with 3 microphones. It recognizes the best audio stream available and switches them automatically. Wind noise removal was again improved at their new camera. 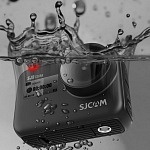 Audio was always a big plus for GoPro cameras which is not achieved by any competitor I tested so far. Watch my Motorcycle Mount video where I compared different cameras. GoPro Hero 4 filtered wind noise way better than other cameras and was the only with engine sound clearly audible. GoPro HERO5 black comes with a frame mount (as the camera itself is 10m waterproof). 2 Adhesive mounts and a USB-C cable. 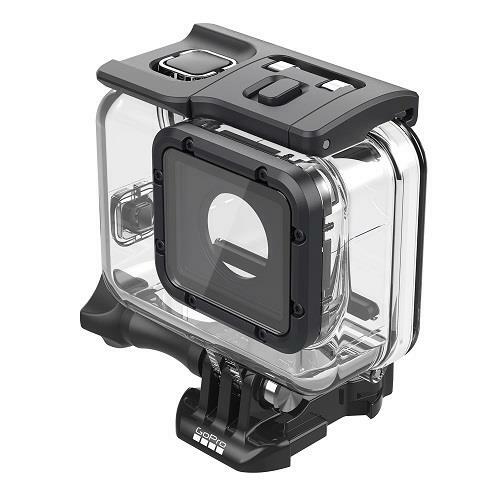 GoPro HERO 5 is 10m / 33ft waterproof without case, but of course there will be an underwater case for diving for up to 60m / 196ft. In the options there is “dive housing sensitivity” selectable, which increases the touch display’s level of sensitivity. The options are Off (default) and On. Turn this setting on when using your GoPro with Super Suit, so you can operate the touch display. Also included is a Skeleton Backdoor if you are using the case for protection to enhance audio recording. This is GoPro’s new remote control “Remo”. Remo is a waterproof, voice-activated remote for HERO5 black and HERO5 Session. You can clip it to your clothes or strap it to your wrist or gear. Remo enhances the voice control of HERO 5 camera in windy and noisy environments. It can also be used as a one-button remote from up to 33ft (10m) away. 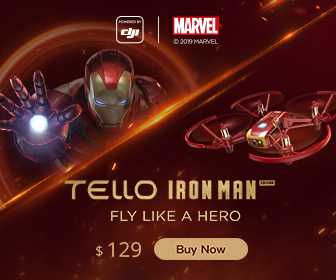 It understands 13 commands & 10 languages and comes with Clip & Wrist housing and a USB-C connector cable. Exposure Select, which allows you to select a certain area of your photo to select the correct exposure. Colour: Allows you to see the difference between GoPro colour and Flat colour on the LCD screen, while using Protune. New shutter selection in Protune, allowing you to choose your shutter speed. RAW Audio setting, which appears to create a separate audio track while recording video. Rear LCD Brightness is now selectable from 10% to 100% (and OFF). Let’s summarize: The new GoPro HERO 5 offers max. 4K resolution at 30fps. 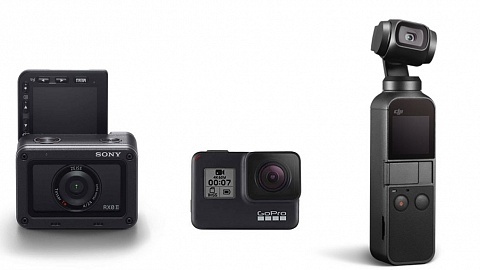 That’s the same as GoPro HERO 4 black. 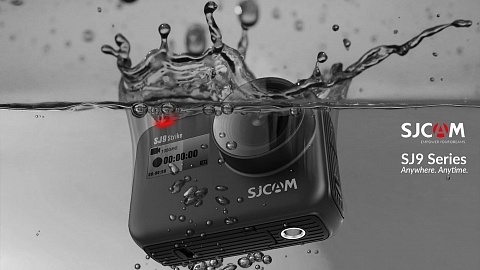 However it is waterproof without a case up to 10m and has an integrated 2″ touch screen. That’s new to a black edition as only GoPro HERO4 silver was equipped with an integrated display, but was not capable of 4K video recording in 30fps. Many users – at least the comments and rumors I read – were waiting for 4K recording at 60fps or even 8K recording. 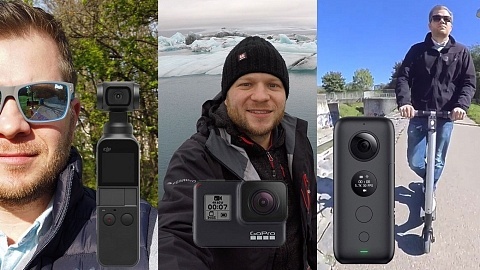 They may be disappointed with the offered resolutions, but I think GoPro did a great job to improve other features for better control, imaging & audio to make it the best camera they ever built. 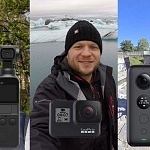 Yet I think the main announcement today was not about GoPro HERO 5 – it was the release of the Karma ecosystem! Karma is not just a drone for GoPro, it’s a lot more than that! The heart of Karma is a gimbal, which you can use on your drone, as well as mounted or handheld! GoPro created a totally new recording ecosystem including a new camera. It’s a whole production package which gives you a huge variety to get the best shots and angles of all your activities. All parts up to now were only available from 3rd party manufacturers which required a big bag to carry all accessories including the individual batteries and chargers! Now all your gear, for aerial, stabilized mounted & handheld shots, work seamlessly together, are easy to use and fit conveniently an an included backpack! 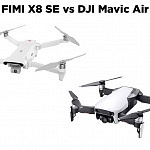 Take a look at their video to understand the whole ecosystem or read my post about GoPro Karma.